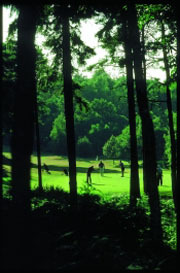 This unique facility has become the major golfing resort in the area, offering the 9-hole Manor Course for less experienced golfers - or for those seeking some serious short game practice - and two 18-hole Championship courses which have staged a number of prestigious tournaments, including the European Tour Qualifying School. When you experience the quality of the golf on offer you can see why so many high quality players have been nurtured at Foxhills. The 6,743-yard Longcross and the 6,892-yard Bernard Hunt championship courses offer a mesmerising blend of challenges that include the very best features of classic inland course design.